PIKO has released a new-generation track cleaning loco, based on a GE 25 ton prototype diesel loco. This engine uses replaceable, ribbed-mesh, spring-loaded cleaning pads, in conjunction with four traction tires and a powerful 5 pole battery powered motor. One can choose six rechargeable AAA batteries, or use alkaline or lithium instead. The loco has an easily accessible on/off switch, and the radiator front housing allows easy access to the battery pack. There are also two white LED headlights front and rear. This engine has a reverse switch, so presumably, you could run two locos back to back for more efficient cleaning of larger layouts. 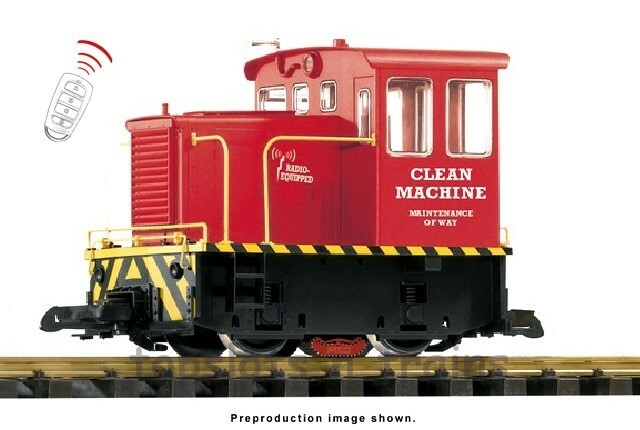 The PIKO Clean Machine received a glowing review in the latest issue of Garden Railways, and it performed as advertised. There is also an as yet unreleased version (38506) which is red in color and has RC control with battery or track power, at a higher price point. The basic yellow unit is priced under $200, and is readily available at the usual dealers that handle PIKO products. There are also several track powered versions of this loco in different liveries available. 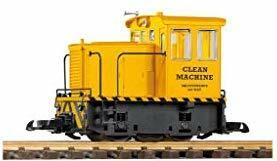 My Clean Machine will arrive tomorrow, and I will report on its use on my indoor layout shortly. These locos have very nice detailing and ball bearing, chromed wheelsets. The materials and paint finish are also designed to be UV resistant for outdoor use. Tried mine last evening, and after 15 minutes, it did a fine job cleaning my LGB R2 oval. Has nice directional white LED headlights and the six 1.5 volt AAA lithium batteries are ample power for this model. The separately applied details like handrails and cut levers, plus the bell and horn are nicely done. An extra set of easy slip-on cleaning pads are included, and there is a hook and latch coupler on each end. Ran it forward only last night, but will run it backward for 15 minutes tonight. The all-wheel traction tires are very effective. The cleaning pads are a type of ribbed mesh material, and they should have good longevity, especially on smaller layouts. The new as yet not released red RC model is also battery powered with its own remote, and reportedly can be switched to track power, but that will have to be verified when they are delivered. The box and packing were more than adequate, and the manual and parts list included exploded diagrams. Easy set-up, including removal and re-insertion of the battery holder through the front radiator assembly. There is room for a sitting engineer, but, unfortunately, NO control panel for him/her to operate! Since this particular model is a dedicated cleaning machine, and not a hauler, a figure is a moot consideration! Ran my clean machine again last night in reverse for about 20 minutes, and the rails literally shine. The basic yellow unit is priced under $200, and is readily available at the usual dealers that handle PIKO products. Only in large scale do the masses put up with brass track and plastic drive block geartrains. And just perhaps some of those masses would prefer a device to eliminate the tedium of cleaning brass track with a hand block sander? Well if they choose brass track then perhaps should suffer the tedium of hand cleaning as that'll remind them of the wise choice they made esp. if it's a track powered layout. Seriously, I am a LAZY person when it comes to two unpleasant tasks in our hobby: track cleaning and lubrication, though the latter is relatively more pleasant than the former. Also, being OCD on a sub-clinical level, I require things to be done in a thorough manner, and the PIKO Clean Machine is a nice looking and effective track cleaning loco. This model of a GE 25 ton diesel actually looks great going around my original LGB R2 loop, and is quite entertaining in its own right. As for the $193 pricetag, I feel I got my money's worth, and after conferring with Dan at PIKO, USA and Ken Bianco at Trainworld, these little "critters" apparently are selling well. I will be buying the RC model from Trainworld when it becomes available. Already promised Ken Jr. (at York) that I would be doing so. Allen: PIKO did a nice job on this little 25 ton loco, my only possible minor criticism being the lack of control panel detail and an engineer figure. They do offer a seated engineer figure as a separate purchase, and there is a seat for him! Personally, I also like the track powered "Blue Goose", but I am holding out for the forthcoming BR 54 (PIKO 37222), due out in June, according to Dan and Ken. So tell me...what other scale puts up with brass track and all the associated problems? Back in the 60's we dumped brass for nickel silver rails back in the 60's. O gauge...tinplate, nickel silver or stainless. I've seen firsthand how large heavy G Gauge engine will wear out brass rail on an indoor layout in a year. The curves wear out. The one that came up with the class system is you...just now! So in a few paragraphs your both a victim and a peasant?? Guess CASEY missed my "LOL" and the laughing face in my quoted post? It was an attempt at humor. Lighten up! My experience with original LGB brass track: I have used LGB brass track (inside only) over several decades in radii 1, 2 & 3, and have never noticed any excessive wear on my track. The heaviest engines were the RhB croc #414, the 2085D mallet and its digital sound version, and the SR Crescent Mikado. My understanding is the LGB alloy was superior to that used in other types, and that they used virgin brass, instead of recycled. Oh, and I occasionally ran live steam on some temporary outdoor LGB R3 track: the LGB/Aster Frank S, the Roundhouse Engineering SR&RL #24, and a Geoffbilt two truck Shay without any ill effects. Luck of the draw - who knows? And the trains run with track power. FRED: THANK YOU! 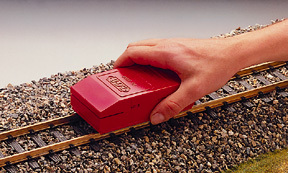 I am aware of several European layouts that employ LGB brass track without the "wear" issues mentioned above. It comes down to personal preference, and I choose LGB! Besides, I have NO desire to deal with those pesky Aristocraft stainless steel track joiners! As I stated above, I am basically lazy and not as flexible at age 76! LOL!